I always love having a full and delicious breakfast and sweet treats definitely stole my heart. Even though back in Vietnam, we are more likely to have savory dishes, such as Vietnamese sandwiches with assorted fillings (pork pate, Vietnamese ham, fried egg, char siew pork, pickled vegetables…), the world famous Pho, noodle soup, sticky rice…, I can really spend a whole day talking about breakfast choices in my hometown but you got the idea, I still built a strong constant love for sweets. I’m more into pancakes with fruits and syrup, a muffin, a slice of cake or simply toasts with Nutella and jam. So for the days when I have more time spending at home, not rushing for school or work, I really enjoy making breakfast, and I usually go for French Toasts. They are extremely versatile, you can enjoy them with powdered sugar and fruits, or stuff them with apple and salted caramel sauce. 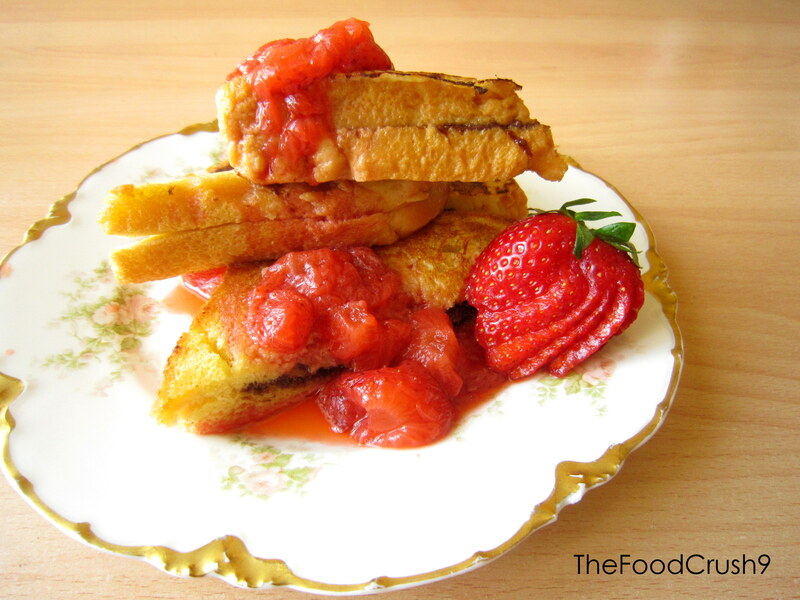 Just under 30 minutes and you have for yourself and your loved ones an intriguing and nutritious breakfast. 1. Gently wash the strawberries and cut them into chunks. Transfer strawberries to a small sauce pan, along with 1 tbs sugar and 2-3 tbs fresh water. Bring the sauce to a boil then reduce the heat and simmer until the sauce thickens, smash your strawberries chunks occasionally for a smoother sauce. Turn off the heat and set our strawberry sauce aside. 2. Spread Nutella (or any chocolate hazelnut spread) over 2 slices of brioche and gently put the 2 other ones on top and press them down to seal the Nutella filling. 3. In a shallow plate, whisk an egg until fluffy. Add milk and mix well. Soak the stuffed french toasts in this mixture, 1-2 minute per side. 4. Heat a large frying pan over medium high heat and melt 1 tbs unsalted butter. 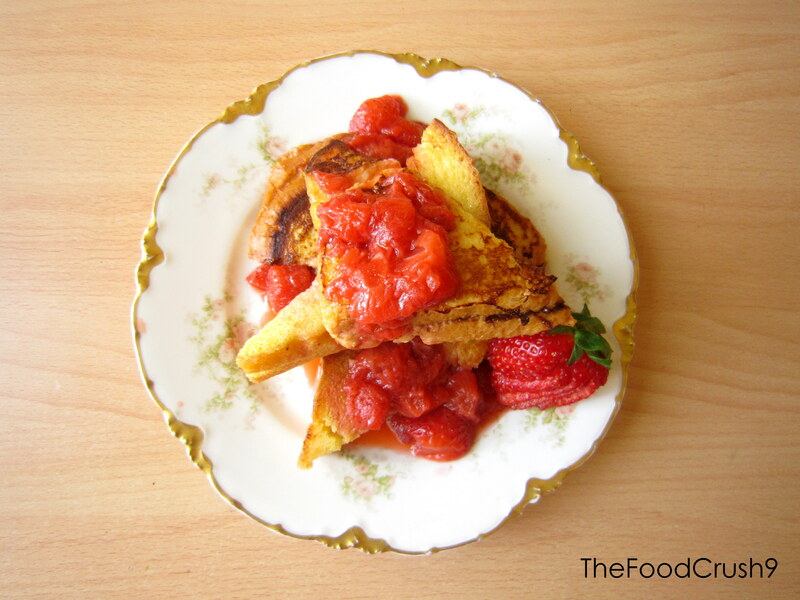 Nicely put the French toasts into the pan and cook them until golden brown on both sides. 5. Transfer the French toasts to a cutting board and cut them in half diagonally. 6. 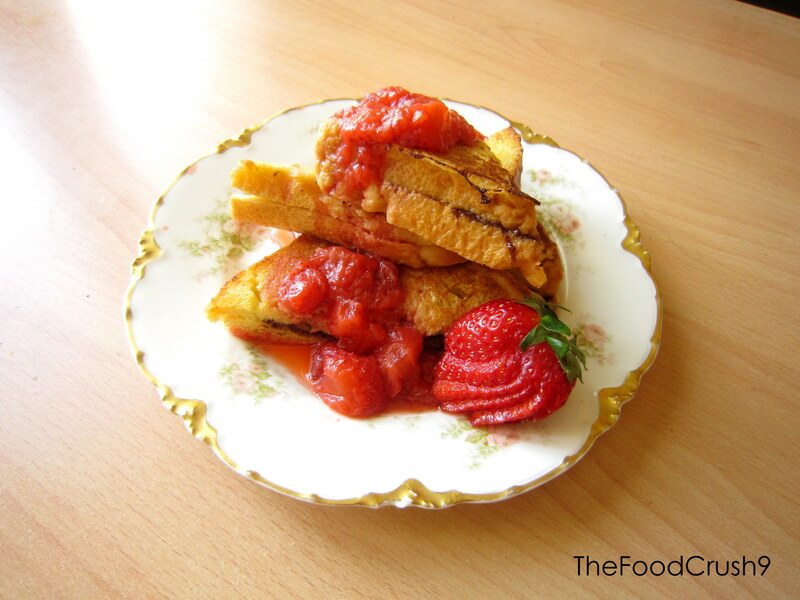 To serve, stack our French toasts on a plate and laddle some spoonfuls of strawberry sauce on top, you can also decorate with some fresh strawberries, and enjoy !